In this entertaining homage to the golden age of the cocktail, illustrator Edward Hemingway and writer Mark Bailey present the best (and thirstiest) American writers, their favorite cocktails, true stories of their saucy escapades, and intoxicating excerpts from their literary works. It’s the perfect blend of classic cocktail recipes, literary history, and tales of the good old days of extravagant Martini lunches and delicious excess. 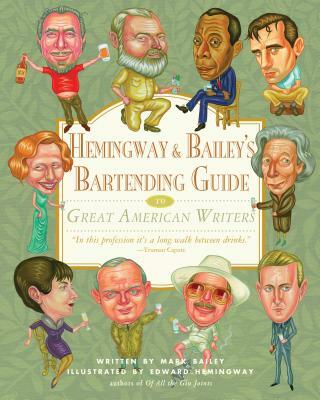 Forty-three classic American writers, forty-three authentic cocktail recipes, forty-three telling anecdotes about the high life, and forty-three samples of the best writing in literature –Hemingway & Bailey’s Bartending Guide to Great American Writers delivers straight-up fun. Mark Bailey is an author and Emmy-nominated screenwriter. His previous books include American Hollow, Hemingway & Bailey's Bartending Guide to Great American Writers, Of All the Gin Joints, and the children's book Tiny Pie. His films have appeared on HBO, PBS, Netflix, and Lifetime. Bailey lives in Los Angeles with his wife and three children. Edward Hemingway is a writer and artist living in Brooklyn, New York. He has done feature reporting for GQ Magazine, written comics for Nickelodeon, and been featured twice in American Illustration. His artwork has been included in the New York Times, Abercrombie & Fitch Quarterly, and Nickelodeon Magazine, among others. He is the cocreator and illustrator of the book Hemingway & Bailey’s Bartending Guide to Great American Writers, which has been published in three languages. He has also written and illustrated the children’s books Bump in the Night,Bad Apple: A Tale of Friendship, which was selected for the 2013 Society of Illustrators Original Art Show, and Bad Apple’s Perfect Day (August 2014). He is the illustrator of the children’s book Tiny Pie, which has been published in two languages. An undergraduate of Rhode Island School of Design and a graduate of the School of Visual Arts, Hemingway has been a guest on NPR’s Morning Edition, and his artwork has been featured in several shows across the country, most recently at the Brooklyn Public Library. "You'll be convinced that a writer's soul resides not in the heart or mind, but in the liver."